To create Our Footloose Remake, screening December 3 at 92YTribeca, the 1984 gotta-bust-a-move-in-this-small-town classic that put Kevin Bacon on the map was divided up into 50+ different scenes, and each scene was handed to one of 55 filmmakers all over the planet—each of whom did something decidedly different with it (animation! puppets!). The project was inspired by news that Paramount had plans to remake the iconic movie and were considering the likes of Zac Efron and Chace Crawford to play Ren McCormack (the role ultimately went to Kenny Wormald, who has danced on tour with Timberlake and the Pussycat Dolls). 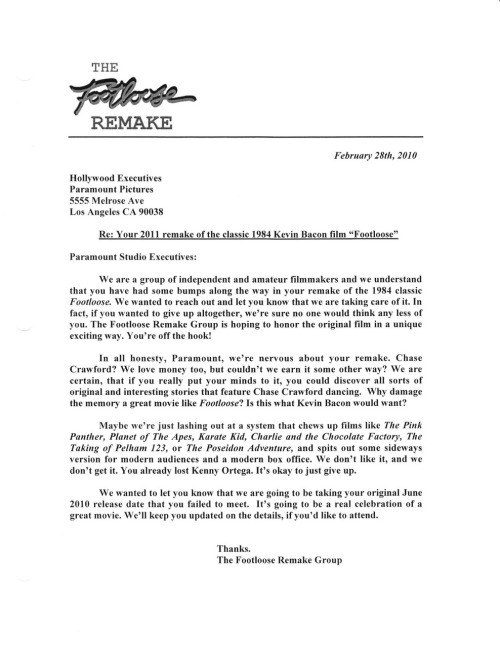 As Dave Seger, the project’s co-creator (whose day job is the NBC show Community), has said, “If anyone’s going to ruin Footloose… it’s us.” So he and the rest of “The Footloose Remake Group” sent a letter to Paramount (highlights: “Chace Crawford? We love money too, but couldn’t we earn it some other way?” and “we’re taking care of [the remake]. You’re off the hook!”) and proceeded to find dozens of Footloose fanatics to reboot the movie in their own way. It’s crowdsourcing for the age of the mashup, and the result strums the same chords plucked by everything from Glee to musical singalongs to those “hey, we should have a Thriller zombie dance recreation at the wedding!” YouTube sensations. But most of all it highlights the fact that film-savvy fans the world over have something to say inspired by the story of Ren McCormack and Ariel Moore (not to mention Reverend Shaw Moore, the bible-thumping minister who’s out to keep the town’s loins from being inflamed by the demon dance). Also? It makes it virtually ironclad that Footloose gave us the best soundtrack of the 1980s. Trailer below. Our Footloose Remake, December 3 at 92YTribeca, 200 Hudson Street; 212-601-1000. Tickets $10 at 92Y.org.